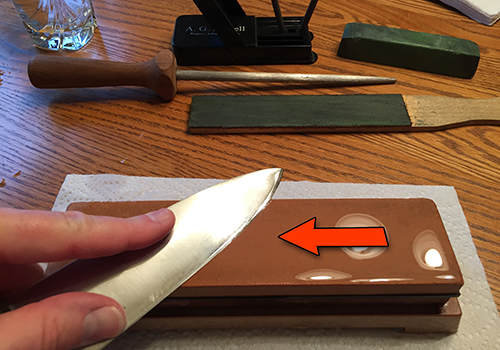 Learn how to hand-hone your kitchen knives using a Japanese waterstone. With practice, you will be able to achieve a razor-sharp edge while maximizing blade life. All modern production knives are factory-ground on belt sanders which puts a keen edge on the blade. The sanding grit produces micro-serrations which look like a series of mini-saw teeth when viewed under a microscope. 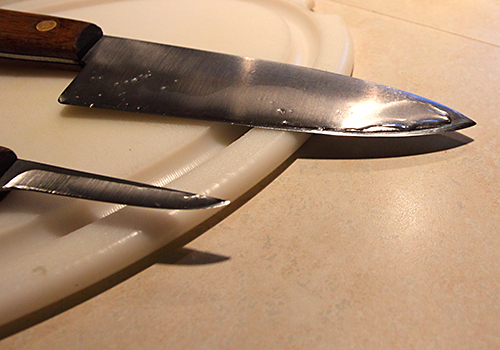 While a new blade will easily bite into the food you are cutting, it will inevitably dull over time leaving less than satisfactory results. This is most apparent when cutting delicate food like tomatoes. That toothy bite is what cuts so nice. It’s difficult to bring back that finish as the edge profile becomes more obtuse. But with a little sharpening practice you can get pretty decent results. And with a lot of practice you can put a shaving-sharp edge on most of your kitchen knives. Once the initial grind wears away, you will be forced to reshape the bevel to match the original edge profile. You may choose to do this with a commercial power grinder, pay someone else to do it for you, or grapple the task manually with sharpening stones. Surprisingly, the manual stone method produces the best-controlled results with the least metal taken off the blade — thereby dramatically extending the life of your blade. Japanese culture brought us the historic Samurai warrior class — their blade smiths produced superior-quality swords and knives for over eleven-hundred years using metalworking techniques that remain unsurpassed. Following this legacy, it comes as no surprise that Japan also produces some of the best sharpening stones on the market today. Waterstones use water instead of oil as a cutting lubricant. The stones cut by forming an abrasive slurry over which the blade is passed. The benefit of this method is that as the stone wears down, a new cutting surface is continuously exposed. With oil stones, the pores of the stone eventually get clogged with metal residue, which reduces the cutting efficiency. Choose two stones in 600-medium and 2000-fine grit for putting a keen edge on your kitchen knives. Submerge them for at least ten minutes in water before use. It is critical that you maintain a proper angle on the bevel which is consistent down the entire length of the blade. This takes practice and patience. Use a consistent back-and-forth stroke until the edge forms a tiny burr on one side, then flip the blade and backstroke the blade (edge trailing) to remove this burr. Finish by stropping on a leather pad loaded with 0.5 micron green chromium oxide. With practice, your edge should rival that of newly-ground production knives. Chef’s Choice® is a great alternative for those who don’t have time to sharpen by hand. These electric sharpeners work by passing the knife blade over two rotating power wheels which grind the blade to the proper bevel and then steel the edge for a razor sharp finish. The caveats are cost (their best model runs almost $300) and excessive removal of metal which will wear out your blade much faster. Yes, plain ‘ol sandpaper. Years ago I never would have believed this, but 600-grit sandpaper on a bench does an amazing job at putting a new finish on a dull blade. It’s quick and inexpensive. You have to choose whether you want the blade flat ground (Scandi grind) or convex. If you go the convex route, use a mousepad under the sandpaper and a light touch. Always backstroke the blade (edge trailing). Finish off with 1500 grit and then a strop. The humble steel is an overlooked kitchen tool. Many people don’t know its importance in maintaining an edge. It’s purpose is to realign the microscopic burr that forms after an edge becomes worn. By passing the steel along the edge on each side of the blade, the bur is removed by aligning the cutting teeth of the steel so that they are inline with the blade and not bent to one side. 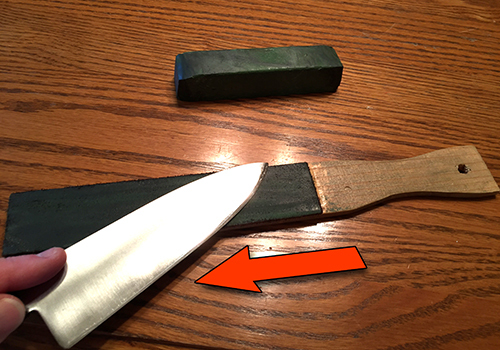 If used correctly, the steel can touch up an edge without the need for taking the knife to a sharpening stone. This will also extend the life of the blade. Only a light touch is needed. Steels do not remove metal like a diamond or ceramic honing rod. The cardboard on the back of notepads contains a small amount of clay. That clay will take off the edge roll (burr) lickety-split and further hone the knife to a razor edge. I’ve used this technique in combination with a strop stick, or by itself as a quick touchup when I didn’t have access to my strop. Always alternate strokes with the edge trailing. Ten on each side should do the trick. After steeling or sharpening, pass the blade CAREFULLY over your leg, while wearing your favorite bluejeans using a low angle with the edge trailing. Do about six passes, alternating from one side of the blade to the other. Let the point of the knife also trail. For safety, pull the spine of the knife toward you so you don’t cut yourself. You’ll be amazed how this simple trick can add that final touch on a sharp blade. This technique also works with the backside of a leather belt – essentially a strop. The term “razor-sharp” is widely misidentified. Fact is, most people lack the skill to put a razor edge on a well-used kitchen knife. Razors by design are ground thin so that fine edge is inherent, which makes them cut so nice. The thickness of the blade and edge profile on kitchen knives cannot match this. Only two knives in my collection will readily pop hair off my arm like a shaving razor. They both are thin carbon-steel pocket knives from the 1940s. 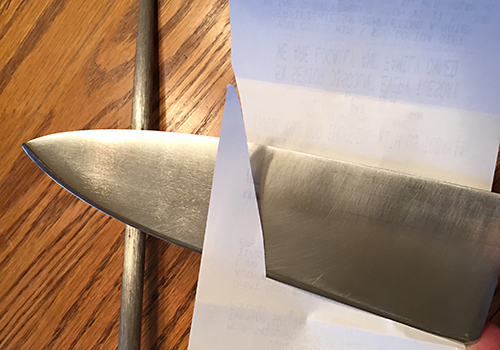 Your knife is sharp enough for kitchen use if it can push-cut through standard loose-leaf or printer paper. Another great Northwoods Wisconsin test is to carefully push the edge across your thumbnail with only very light pressure. If it removes shavings off your thumbnail, it’s sharp. Next, try it on a tomato. If it pushes easily through the skin of a tomato without mashing it, you’re good! 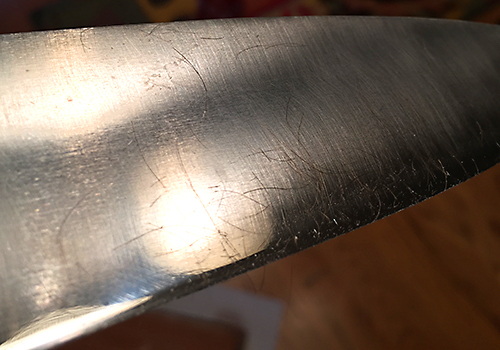 Most people have different methods for sharpening, but the one I found that works the best is to maintain a consistent angle with the edge trailing. That way you don’t risk rounding over the edge and tip or gouging the stone. Always keep a Japanese waterstone saturated. Scrub off the metal residue with a wet paper towel when it becomes dirty. The soft stone will eventually become cupped from use. Use a flattening stone to bring back the flat surface. My secret weapon — a home-made strop stick; basically a strip of suede leather glued to .25″x1″ pine. The leather is rubbed with 0.5-micron green chromium oxide. Always strop at a low angle with the edge trailing. Pay particular attention to the point of the blade, so you don’t round it over. Alternate twenty strokes on each side for a perfect edge. Once the angle and edge profile of the blade are “zeroed”, it’s pretty easy to keep the edge hair-popping sharp. 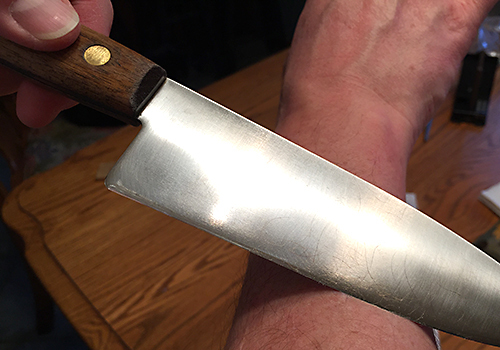 This is a standard Chicago Cutlery butcher knife made with 420 HC stainless steel. Only very light pressure on the blade is needed to shave with it. A close-up of hair removed from my arm with a razor-sharp butcher knife touched up on a Japanese waterstone. Note the edge profile is wider (shallower) than the stout V-grind put on factory edges. It is also slightly convex due to the inherent back-and-forth stroke done by hand, with no microbevel. Due to this, it rivals the sharpness of any factory-grind edge, and is also much more durable. 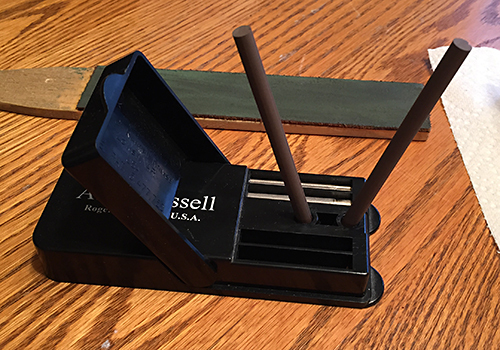 The venerable A.G. Russell® Field Sharpener. This is an excellent tool for quickly putting a razor-sharp micro bevel on a blade as a touch-up. The ceramic rods MUST be kept clean. They will be coated with metal residue over time which affects sharpness, and should be scrubbed with Bar Keeper’s Friend and a scouring pad. Don’t drop them. They will shatter. I never use the accompanying diamond rods – they are much too coarse and will put deep scratches all over your blades.